Each year, thousands of homeless dogs and cats arrive at the Home in need of treatment and care. Some of them undergo routine procedures, like desexing or dental work. Others need more complicated and sometimes life-saving surgery after suffering severe trauma or illness. Over the past year, our Shelter Medicine Department performed more than 5,300 surgeries on homeless dogs and cats. 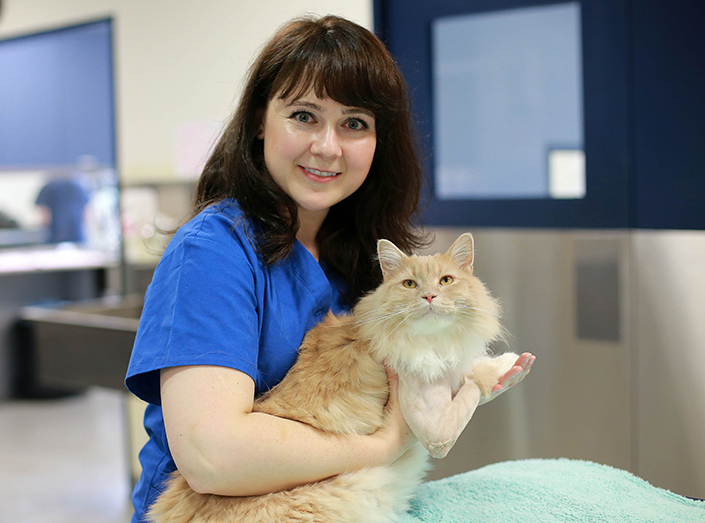 Amid the hustle and bustle of the Home’s shelter hospital and Frank Samways Veterinary Clinic are the dedicated, compassionate vets and nurses who change lives, each and every day. Today – on World Veterinary Day – we’re taking you behind the scenes of the Home’s Shelter Medicine Department, and introducing you to some of its recent patients. Watch the video here. 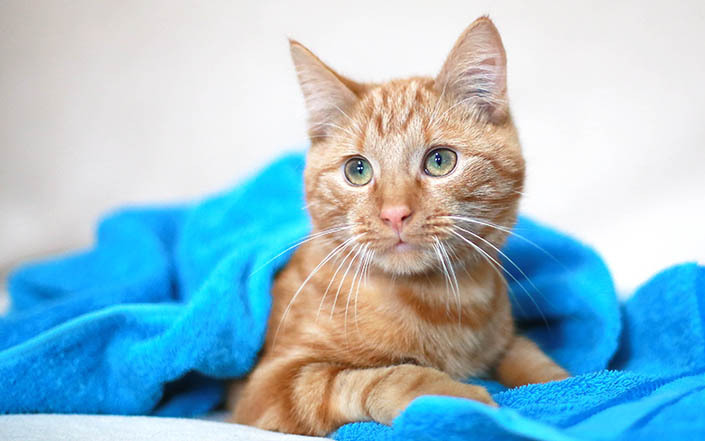 Russell, a six-month-old domestic short hair, came to us after being hit by a car. He was lucky to survive the ordeal, but he suffered a nasty fracture to his left hind leg and a less severe fracture to his right hind leg. 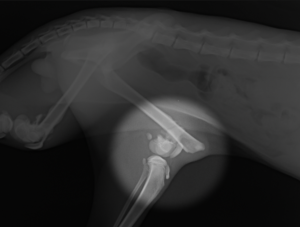 The fracture in Russell’s left leg was chronic and in a tricky position, making repair extremely difficult. In the best interests of his well-being, the decision was made to amputate the leg. Over the past year, we performed 20 amputation surgeries on stray dogs and cats who had suffered trauma. Russell made a smooth recovery from his operation and quickly adjusted to life on three legs. He soon found a loving new home. 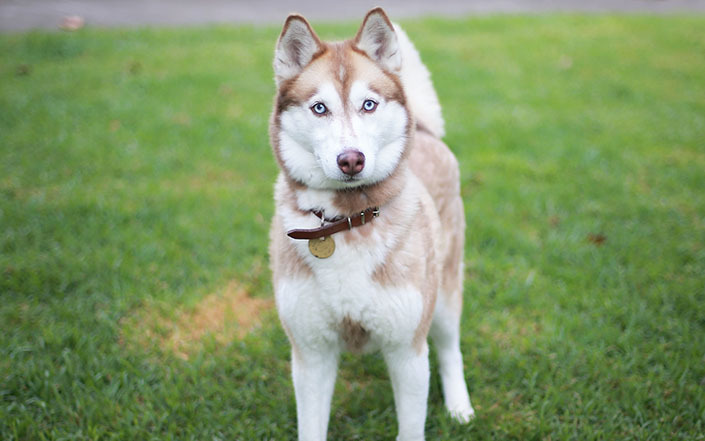 Elsa, a five-year-old Husky cross, arrived at our shelter in need of a new home. But before that could happen, she needed to be desexed. More than 4,800 homeless dogs and cats were desexed at the Home over the past year. 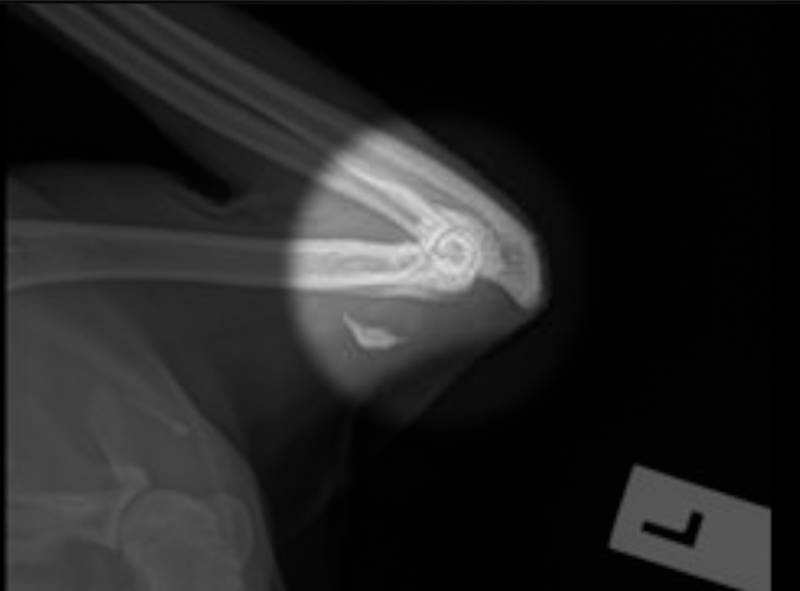 Fortunately, we have the help of veterinary students from The University of Melbourne in performing these surgeries. The day after her surgery, Elsa was ready for adoption. And that same day, she found a wonderful new family. Crumpet, a two-year-old domestic medium hair, came into our care with swollen elbows and was unable to stand or walk properly. X-rays revealed that both of Crumpet’s elbows were fractured and dislocated; a complex injury that we rarely see in our hospital. The injuries were likely caused by a high-impact fall. 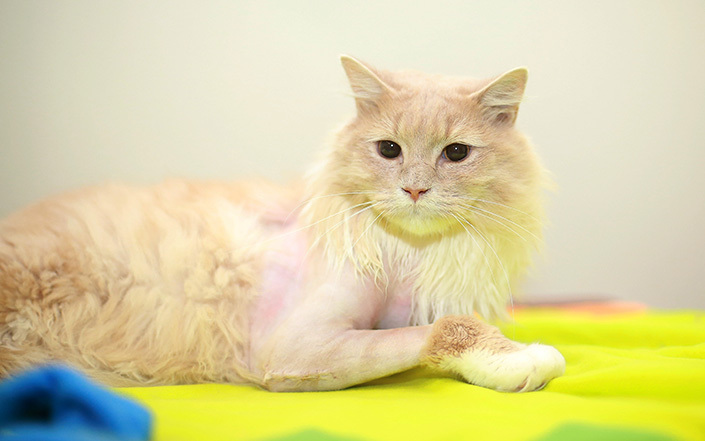 Crumpet underwent a delicate surgery, with vets using surgical wire to pin his elbows. This special cat is going to need special care. It’s possible that Crumpet will show signs of lameness in the future. Crumpet is comfortably recovering under the care of our vets and nurses. He will soon be heading off to his new home. The support of animal lovers like you is what keeps our shelter hospital up and running, making it possible for us to provide treatment, care and a second chance to homeless pets. Please donate today to support the work of our Shelter Medicine Team.